I know it's Thanksgiving for our American neighbors and I'd like to wish you all the best of days spent with family and friends. Here in northern NB, Canada, it's beginning to look like Christmas. The snow didn't stop the birds from visiting the feeders though. I stayed in for most of the day,wrapping something I need to take with me this weekend, making a Christmas arrangement for my front step, and making chicken soup. I've added some battery powered lights for night time. Once the snow let up to flurries this afternoon, I went out to do a little shoveling around the walks and the steps. My husband will take the snow blower to the rest tonight. It is hard not to find enjoyment in the pretty views despite the fact that it's not even winter yet. 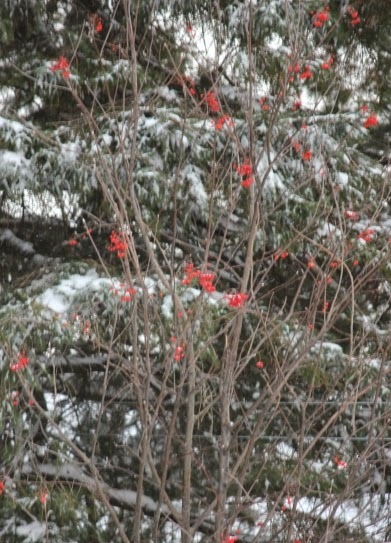 The Mountain Ash with the red berries and the snow against the backdrop of fir trees is so beautiful! I will be away from the blog until mid week next week. We're combining a doctor's appointment in another city with a visit to my sons. It should be interesting; they're bringing home a new puppy tomorrow and their first one isn't a year old yet. They are our grand puppies and since we have no grand children, I'm sure you'll be seeing some pics next week. sunny kitchen table from Holly on Vimeo. Today was so warm and sunny that after feeding a chickadee from my hand on the deck, I set up at my kitchen table to paint. This is what I was doing in the video. I just love the sight of a colorful clothesline full of cloths gently billowing in the wind. I've been invited to participate in the Blog Hop Around the World by Eileen Gidman I will be answering a few questions and inviting additional bloggers to join. This is a mug rug that she has just finished dye painting and stitching as a commission. Her work really speaks to me. I think she does in dyes on fabric what I try to do with paint and thread. We are attracted to similar things in the outdoors and we each express it in our own way. This morning was my scheduled cleaning time when I make a quick sweep of the bathrooms and vacuum the main level. I like to get things done early in the week so I can be free for creating time! As far as my artistic endeavors, I am currently attempting to paint a small gift in watercolor. I use watercolor frequently, but usually only in my sketchbook. They usually stay there as references and inspirations for my fiber art. However, I recently took some pictures in a very beautiful garden belonging to a friend who lived in a house built on a slope which had to be torn down. I wanted to do something as a special keepsake. It was going pretty well until I added a tree trunk that shouldn't be there! I'm going to have to start anew as one can't easily remove with watercolor. The second thing going on in my studio right now is the sewing together of selvages following a great tutorial here. I want to make a sewing machine cover for a new (to me) machine that I just bought. I don't have a lot of selvages yet, but I could use them as a feature section as shown in the tutorial on the cover that she did.. I think others could probably tell me more about my differences than I could. I have absorbed information and techniques from many sources--workshops, books, on line classes and blogs, using it all to experiment and express my vision of my world in my own way. 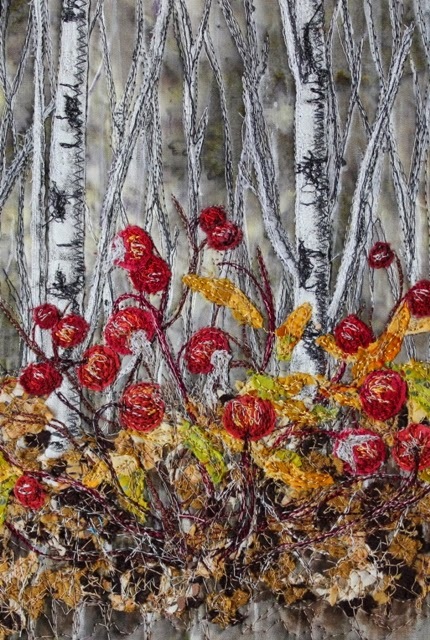 For example, in my last fiber art piece, Birches and Rose Hips, I used many techniques including painting the background in a shibori technique that I developed and wrote about in Quilting Arts magazine. I have done several versions, one each fall, and each one is different and each shows progress. I like to combine paint, images from nature, collage, thread painting and sometimes hand embellishing. My process usually begins with something I've seen in my yard (I love to photograph the birds and my garden) or more often something that draws my attention on my walks on the trails. I take pictures and I sketch, getting a feel for how I want to portray it in fiber. This process can percolate in my head for a few days to a few weeks and occasionally longer. Sometimes I work on a piece continually from start to finish; other times, I stall and it goes up on my design wall until one day it strikes me how I need to finish it. I would like to invite more bloggers to join in the hop. This blogger , Riel Nason, is a writer and a quilter also from New Brunswick. She has written a book which I loved and does some very creative things with selvages. 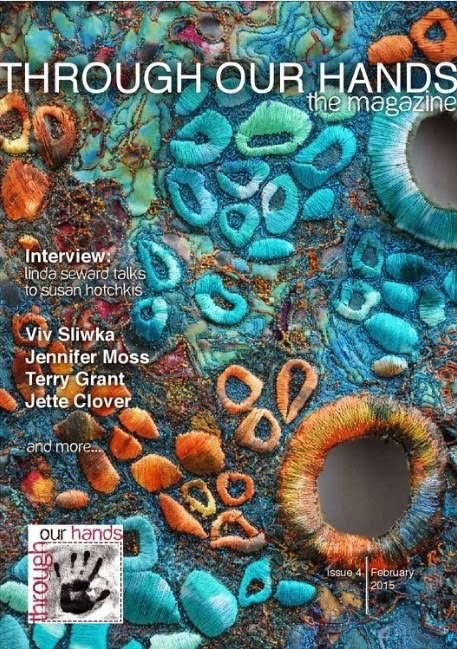 The next blogger, Jennifer Scantlebury Vienneau, also from NB, is a fellow creative who has recently taken on long arm quilting and is doing some unique stitching. 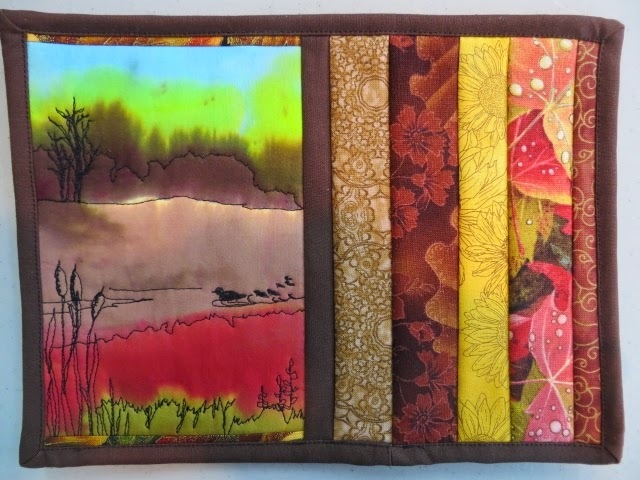 She also does some dyeing, painting and creative stitching on her fabric projects. 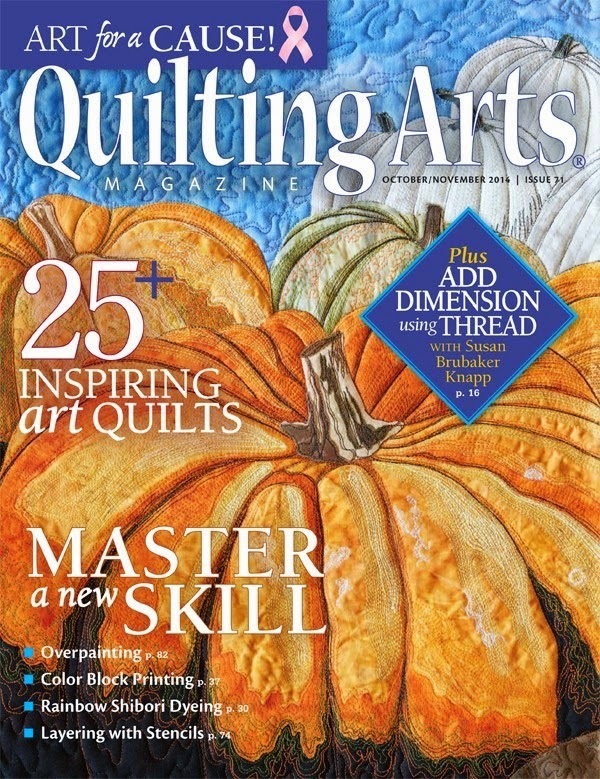 Finally, I would like to invite a long time blogger friend of mine, Margaret Applin, who has written for Quilting Arts Magazine and done DVD's for Quilting Arts TV. I love her design style and hope to see some of it in fabrics in the near future. She does a lot of doodling and digital collage for her designs.This is one of my favorites from this past Studio Sunday post. I hope you have time to visit each blogger here and get to discover someone new to you. Have you seen the microwave pot holders circling the net recently? A few members of our guild have been sewing these at our Saturday sewing days. I thought they might be useful but wasn't sure until my friend Alice said she was making a set for someone who wanted to use them to take to the table. I can see how I might use it when I take my dinner to the TV room! The ones I made fit my flattened bowls perfectly. For most of the day I've been puttering- washing, finishing up odds and ends like the bowls, and repairing clothing. It's a cold grey day. I admit that I stayed a little longer in my PJ's today while I sipped tea and worked at the crossword. Still, I give myself a little creative time. I picked up the photos of a few scenes that interest me, yesterday and I started transferring one to a watercolor pad and I've laid in a pale wash for the water and sky. It's truly an experiment for me because I have it in mind as a little gift for someone. Generally, I only do watercolors in my sketchbook as references for fabric art--never for framing on their own. I get too picky and tense with watercolors, but not so usually with my fiber art. Isn't that odd? I got a few pictures of a little nuthatch that has been frequenting the suet cage on our deck. They are so sweet. Happy Thursday! Tomorrow I plan to swim, go to lunch, and get a few errands done. 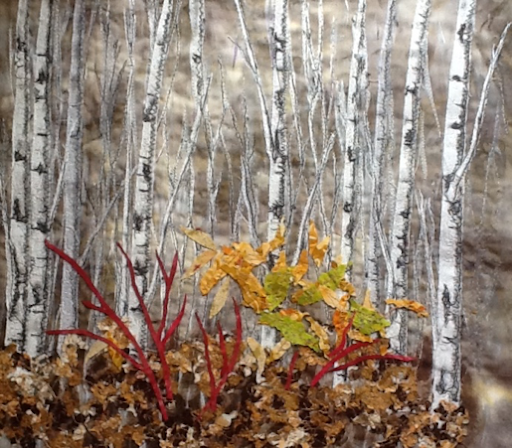 I felt a little bereft this afternoon without my Birches and Rose Hips fiber art piece to work on. I have passed it on to the buyer, a friend, who is going to check out the framing options. It will be coming back to me for the final finish. It's a rather mild day, although windy and I just couldn't work up the energy to go out and clear off the bit of snow on the driveway. I did at least do the front steps. After lunch with my tea, I read for a bit but my mind kept straying to my most recent photos. I moved to my computer in my studio and did a preliminary sketch of the hillside that fascinated me. There are lots of nooks and crannies in the rocks to loose one's way in. I would likely simplify if I were to do it fiber. 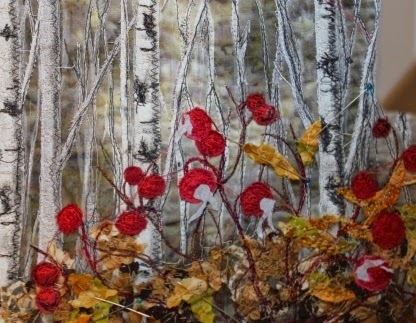 This afternoon, I was very happy to put the finishing quilting stitches onto the Birches with Rose Hips. I am going to pass it on to the client who is looking into framing options. Usually, I finish my pieces as quilted wall hangings with a binding. This piece is going on a wall over a sofa and since it is approximately 12" by 14", I think a mat and a frame would give it more presence. 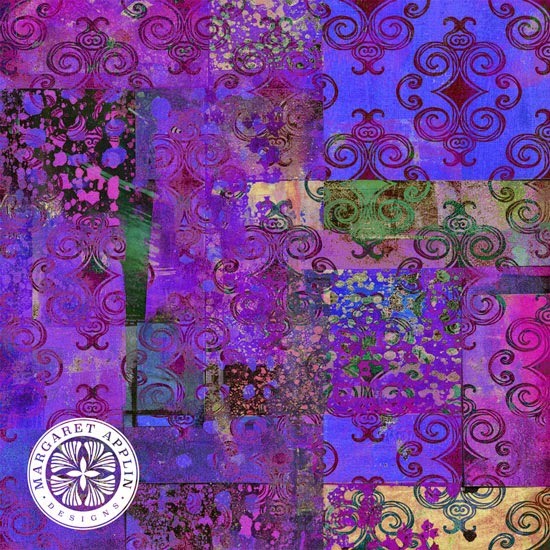 I'm thinking that sections of it would make pretty cards- with permission of course. Caught this little lady hanging on the suet cage on my deck at lunch time. It's a downy woodpecker. Now the question is what shall I do next? Well, I have a couple of Christmas things in the works, some ideas floating around in my head, and some inspirational photos that I took the other day. These scenes are about 5 minutes from my house by car. like the hillside sloping into the water in the next one. Love the pinkish hue in the background sky. I have sent a few to be developed in 5 by 7 and 8 by 10 sizes. I like to have them for reference when I am stitching. I hope you too are having a nice Monday. Finally, I awakened to a beautiful sunny day today! I got my sheets on the line and went out to the yard to do a few more clean up chores for the winter. We still have a layer of snow and the air is crispy. I also took my poles and went for a 30 minute walk with no stabs of pain to my hip. Definitely an improvement from the cortisone shot. In my studio I cleared away the detritus from my present project and got some things ready to take to our guild sewing day on Saturday. I saved some time to start quilting the Birches with Rose hips. I'm going to keep it simple. The bottom is done and I plan to outline the foreground trees. I am almost finished this piece. The final binding or zig zag edging will wait as it is SOLD! and I am waiting to see how the buyer wants to hang it. My usual method is a binding and a hanger on the back. This one may be mounted in a frame atop a mat but with no glass. Well, the sun has lowered toward the western horizon. I have lost the lovely rays that were shining through the window of my studio. It is time to go make myself a cup of tea and sit for a bit with my knitting. I have spent a quiet day in domestic pursuits while listening to the various radio programs with coverage of Remembrance Day ceremonies. I cleaned a bit, made 3 chicken noodle casseroles for the freezer, and started my healthy version of macaroni and cheese for supper--whole grain noodles, squash added to the cheesy white sauce, low fat cheese, and perhaps the addition of bok choy when I put together. While things were cooking, I worked on these slippers that I'm making. Once the bootee part is finished, there is a cable section that will get sewn onto the top, wrapping around the ankle. There are many versions and free patterns to be found on line if you google Drops Design slippers. I'm using this one called Little Red Riding Slippers. 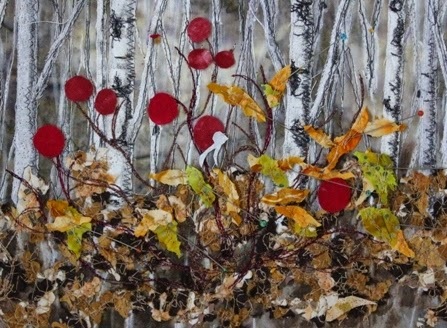 In my studio this afternoon, I finished ( I think) the thread painting on the birches. I've added the batting and a white cotton backing and now I have to decide exactly how much I will quilt. Perhaps the foreground trees and the foreground rose hips. I'll get started another day and we'll see. I'm also adding a link to the Sew Sisters Quilt shop for Blogathon Canada. It's always fun to find more Canadian bloggers! Can you see the difference? I can see the difference another hour or so makes. I bet you can't! And you're probably getting tired about seeing this but it's all about the process for me. In between making muffins and lunch and visiting, I've managed an hour or so of cutting and stitching. I've stitched down most of the leaves and the berries. And I've started to add highlights to the berries. Still more to be done but mostly thread work. I think I'm done adding fabric. When I'm in the middle of it this is what my studio looks like. It's really not very messy. I tend to clean up as I go. Here's another view through the window as I sit at my machine. You can just spy a few goldfinches on the feeder. I'm sharing one more picture of yesterday's bluejay. He looks quite indignant here I think. Yesterday, and into the night, another snowy nor'easter blew through our region. A snowstorm at this time of year is not unusual but it usually melts quickly. A second within a week is more unusual. As th3e sun moved into the sky we saw this sparkly view through the dining room window. I admit I am not ready to let go of fall. I always enjoy the slow transition from the riotously bright leaves of early fall to the more subtle and varied grey and beige colors after the leaves have fallen. I love too the soft pinks hues that the landscapes and sky take on as fall deepens into winter. So I was a bit begrudging of this morning's beauty at first but then accepting that I really have to practice living in the moment, I had to put aside thoughts of fall and stop to admire this typically wintry vista.. It wasn't long before the wind and sun cleaned the branches. I caught this bluejay at the feeder and heated bird bath at midday. Even if a bit raucous and bullying, one must appreciate their beauty. This afternoon, I spent a couple more hours in my sewing studio reworking (again) my plans on the rose-hips. It's really very good that I spend only an hour or two each day. IA piece needs to rest and be viewed with fresh eyes. Even away from a piece, I will think about it and make changes and decisions in my mind. And so I returned to the birches today with the idea that I would use thread painting for the rose hip branches. Last night it struck me that the fabric pieces for the branches seemed too large and cutting them thinner not so easy. I did some preliminary stitching with burgundy and red to locate some branches. Then I've started to lay on some leaves and berries. The next step will be to stitch down the leaves which are pinned on at the moment. I'll add more branches atop them and add shadows, highlights, etc to the berries. I so wish I could purchase thread in the weights and colors that I need nearby. Sadly, even when I travel to a couple of other NB cities later this month, I will not find what I want. I shall have to make do with what I have and look into ordering some. I'm off now to start the dough for homemade pizza. This morning I got a little surge of energy, damp mopping a floor and then heading outside to do a few more gardening chores. We may be getting another snowfall tomorrow. It's not unusual to get a snowfall this early but it seems unusual to have two in one week. The first one hasn't melted either. I just spent an hour and a half finishing up the free motion stitching in greys and blacks on the trees. Before stopping for the day I laid out some of the rosehip structures. I use tweezers for this step and I tend to keep going back to it and moving things. I decided to iron down what I have. It does look a bit flat laying there but that will change once add the berries aLong with the shadows and highlites with stitching. For now I'll stop here. As is my usual routine, I'll wander into the studio now again, adding bits of pieces here and there. It's a bit of a process; one I really enjoy. Today, I've been house cleaning a bit and making soup for supper. I'm coming back from a bladder infection.so a bit slow getting things done. What's good about having a sewing area or studio is that you can leave whatever you're working set up and cone and go at leisure. I just sat down to add a little more stitching to the birch trees-- the grey shadows-- using a charcoal grey thread and a free motion zig zag stitch. I've set up the ai pad again for a short video. It's just not possible to get the rright angle. I am going to try my camera some day! 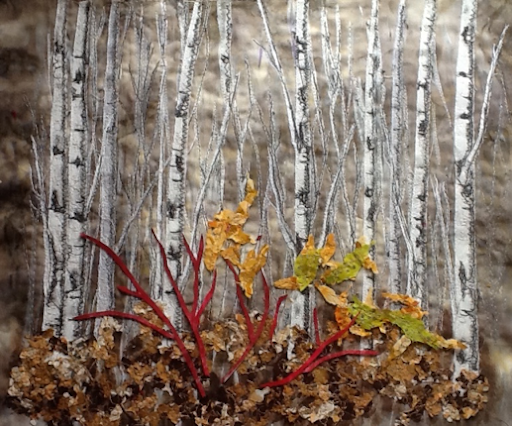 Stitching dark grey shadows on the birches. from Holly on Vimeo. Free motion on birch trees. from Holly on Vimeo. I'm trying to do a few videos using my I Pad. It's a learning process. I can see that the picture would be better if I took out the sewing machine light to stop the glare. The angle is not the best though. I will have to play with that. I have a good camera with a tri pod but have not tried that yet. My sewing studio. from Holly on Vimeo. I spent the morning in the kitchen grating zucchini, making muffins and apple crisp. We ventured out after lunch in the early stages of the first snowstorm of the year to visit with my in-laws. By the time we got home, I was cold and damp, so I made a chai-cocoa tea and headed to my sewing studio.This is the view through my studio window. Notice the snow cover in the background? This was the view of the bird feeding station on our deck yesterday. I love the heated bath. It is frequented by lots of birds and keeps us busy watching throughout the winter. It was too late to get into my birch scene and since my machine was set up for free motion stitching, I decided to quickly stitch another mug rug put together from scraps. I got half way across when I ran out of bobbin thread. I'll go back and wind a bobbin after writing this before I head out to get supper. Tonight is our night for the Bowflex. We bought a second hand one a couple of months ago and hubby and I have been doing the workout together.